Have you ever heard of the debt snowball method of debt reduction? It's somewhat counter-intuitive in that the method recommends regardless of differences in interest rates you pay off your smallest debt first, pay only the minimum on your larger debts, and then slowly work your way up your line paying off your next smallest debt. While it may not make sense mathematically its theory suggests you'll pay off your debts faster consequent to the more frequent psychological benefits of seeing debts disappear. It's about accumulating "quick wins" and then using the pride generated therein to fuel forward momentum. For some people, the same may be said to be true about lifestyle change. The thing about trying to improve lifestyle - change is difficult, and sometimes, almost like being deeply in debt, people feel that there's so much in need of changing that they get overwhelmed even thinking about it. If you're struggling with the sense of an overwhelming amount of change, why not try the snowball method? Spend some time this weekend with a good cup of coffee and make a list of as many specific changes you'd like to make, and then rank them in order of ease. Put the list somewhere prominent and then one by one, start working on crossing them off. 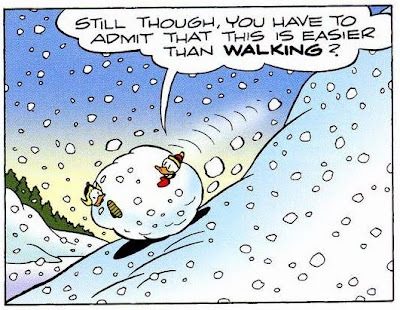 Pride builds a mean snowball.